This apartment has about 67m2, with 2 bedrooms., Terrace, a nice American kitchen open to the living room and a bathroom. This apartment is ready to move into, with private parking, a storage room and fantastic communal garden area with swimming pool, playground, gym and cinema. With very good finishes, has fitted wardrobes, heating, air conditioning and elevator. 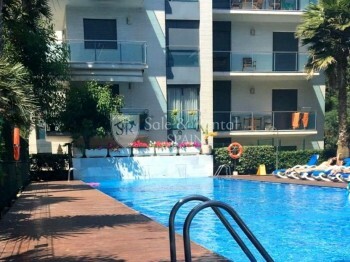 It is a fantastic opportunity, for its high quality and its perfect location, close to all services and in the beautiful town of Lloret de Mar. Come and see it!